Full Tamiya 2015 Shizuoka RC Line up. Kumamon is back! It's that time of year again for the big Tamiya releases. I will cover some more of these cars in details once pictures come available but initially there are some very interesting new cars listed. First up is the 'Entry Level RC car' this could be very cool and an inexpensive way to get others into the hobby. I have a very large soft spot for Tamiya's earlier attempt at this the Tamiya RC Boys series that had some amazing looking shells styled on the Mini 4WD cars. The next new chassis is the MF-01X this is a 4WD mini chassis. It has 3 adjustable wheelbases (210mm, 225mm and 239mm) The chassis is a monocoque shaft driven car with the motor mounted at the rear. Moving onto the more racy stuff and we have the TT04R which we have already had a sneak preview off (here) We then get onto some very interesting cars. The TRF102 this sounds like it will be very nice. It has a T-Bar suspension system like the old F103, it also has the floating battery system where it is elevated of the top deck. (more detailed info below) There is also the new TRF211Xm which seems to be more of an evolution of the last 201Xm chassis. There are some interesting accesories listed as well. The Aluminium chassis is going to be a good option for TRF419 racers who want that extra stiffness for carpet. There is also the TT02-Type S suspension mount stopper which should hopefully give the TT02-Type S the ability to adjust droop. Along with adjustable front and rear steel suspension mounts. 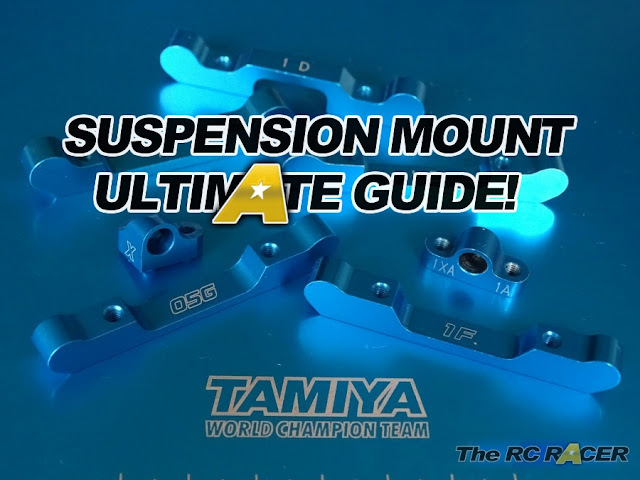 These options could really help Tamiya's TT02-S spec car become a very popular beginners car. More pictures and info when it becomes available, but here is the official list and some translated info on the more interesting chassis below. – Nimble running of 2WD unique from on-road to off-road! – The popular with women and children! Family I enjoy everyone. 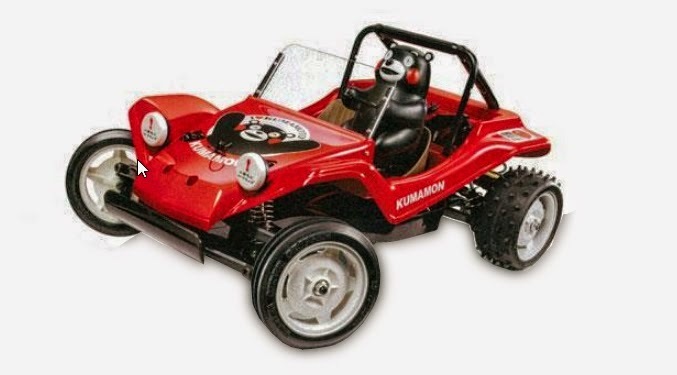 – Electric radio control carrying the [Kumamon] doll in electric radio control two-wheel drive buggy dune buggy is a car assembly kit. – Lightweight open body with no door is made of high impact resin, can be freely painted in color for plastic model. – Also, hold the handle was riding in the driver’s seat [Kumamon] doll set with painted finished state. – And illustrations of Kumamon that stick to the body, I was prepared in Kumamoto Prefecture of specialty tomatoes and watermelon illustrations such as stickers as well. – DT-02 chassis, which was equipped with a four-wheel double wishbone suspension. – Configuration easy assembly with reduced number of parts also features. – Adopt a bathtub frame that low center of gravity by mounting the RC mechanism and traction battery flat. – Suspension 4-wheel double wishbone moving supple. – Is equipped with four coil spring unit will deliver the high road holding even in bad road. – In addition, the built-Diff in sealed gear box to shut out the inherent of sand and pebbles of intrusion into off-road, with a 380 motor. – You can enjoy a long and spacious runs in easy to control speed. – Kumamon figure prepainted. It is also possible to move the head from side to side. Exhibits excellent road surface follow-up in the adoption race new T-bar-type rear suspension for independent control the roll and pitch "TRF102 chassis kit" appeared! I will deliver outstanding road surface follow-up. Furthermore traction battery floating mount fixed to 2.0mm thick carbon upper deck. I pull out the center on both sides cut of 2.5mm thick carbon Lower deck put the bending to the maximum. Front suspension is independent left and right of the king pin coil spring. By making the reinforcing type suspension arms, and has a balance that can be used more bending of the entire chassis. Steering servo uses a new type aluminium servo mount and carbon steel bridge that is lighter, securely fixed by screws. Furthermore servo mount was optimizing the mounting rigidity of the chassis. In order to maximize the bending of carbon Lower deck, adopted a floating mount to fix the traction battery to carbon upper deck. And to achieve a substantial suspension stroke up, creating a handling a sense of stability in smooth. In addition, expanding the mechanical mounting space compared to TRF101. I have increased the degree of freedom of choice and layout of electrical equipment. Adopt new T-bar-type rear suspension that provides a complete independent control of pitch and control. Roll point ball is set to chassis limit low position, and maximize the roll moment. Furthermore pitching shaft is completely self-contained, I have to ensure a smooth moving to the road surface gap. In addition, the new motor mount was made ​​possible to adjust the mounting position of the rear wing. New materials of the industry's first adoption change the run! Off-road racing user attention, appeared chassis kit "TRF211XM" which has made ​​the state-of-the-art evolution! With the aim of success in the future of off-road scene, and developed a machine that employs the industry's first new material! ! - Showed a runner results in recent memory in 2013 IFMAR off-road world championship "TRF201XMW". - I will aim to flagship of a new off-road. - Off-road scene the high speed of the advance. Improvement of grip force will grip the manoeuvrability of the key. - New materials of bathtub chassis that has been adopted aims to grip improvement achieved with no running feeling ever. - Grip force and response force has been greatly increased by adopting the material of the chassis that combines the strength and elasticity. - Success in Tamiya off-road All Japan Championship Tamiya sponsored also making it the promise can be one. New design Riyasutefuna battery Steph donor battery plate, brass (brass) is adopted suspension mounts & Cooling slipper plate. Parts involved in the chassis rigidity to suit the new chassis is the new design. And has adopted the new suspension mount to secure the grip. In addition, slipper plate has been designed aimed at cooling effect. High strength, high elasticity and high impact resistance to the excellent new material "Quick Form (R)" adoption of the bathtub chassis! New of the new generation material "Quick Form (R)". The material is that combines the benefits of metal and resin in high performance stablest sheet to balance the physical properties and modifiability. Despite the material of high strength, is the material most suitable for off-road chassis also notable to say that super-lightweight. Choosing a travel location in handy size "involuntarily want become Tsuredashi to play" has been developed on the concept of "MF-01X" chassis. The main frame is a monocoque structure that is integral to the gear box, and both light weight and high rigidity. The middle of the chassis of the horizontal battery, I've realized the shaft 4WD compact size in the rear motor layout. Equipped with tire of touring car size to 4-wheel double wishbone suspension, and finished in the "play" chassis you do not choose a place to run. Also, change the spacer is joint to the chassis, it is three wheelbase by combining shaft released simultaneously selectable. Compact and fit the chassis concept that can play tough, and chose "Suzuki Jimny" the body. Yet light car, and model the popularity of JB23 type to be full-fledged 4WD cross-country diversity to the base of the competition vehicle and customized car as vehicle. To "MF-01 X chassis" on compact M size, 1/10 in combination with the touring car the size of the rally block tires, perfect for the Jimny running around to healthy image. Even customize the vehicle as well machine to their liking good, also take out the leisure accompany good, it is one that easily can taste the fun of hobby RC car. And transfer the motor power that was installed in the Riyaendo in front in the chassis side of the shaft. Released simultaneously become length of different shaft and three by the combination of the wheel-based can be selected. You can also enjoy in combination with existing M chassis body.